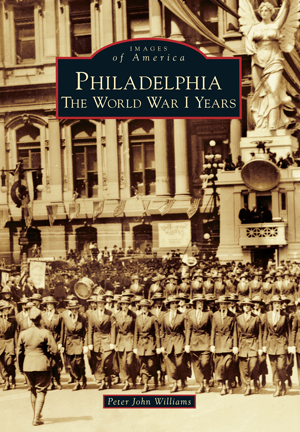 Author Peter John Williams will present “The Home Front: Philadelphia, the World War I Years” on Wednesday, Nov. 15 at 7:30 p.m. at the Haddonfield Lutheran Church. Williams uses photographs, poster art and other imagery to paint a picture of what the city and residents looked like in WWI, from the time American involvement was an open question to when over two million thronged the streets to celebrate the end of the conflict and the return of the troops. Williams emphasizes how events of the day affected people of all social classes and brought them together in new ways. Copies of his book will be available for purchase and signing. William’s presentation corresponds with the exhibition opening at Greenfield Hall in Nov. on “The First World War: Haddonfield and Abroad.” As we mark the 100th anniversary of the end of The Great War, residents have the opppurtunity to have these glimpses into how ordinary people dealt with tremendous upheaval. In honor of Thanksgiving, Haddonfield Historcial Society would like to support the church by encouraging HSH members to bring an item for the church pantry. The Pantry welcomes all donations but especially is in need of canned tomatoes, Cheerios, shredded wheat, paper towels, pasta sauce, peanut butter and paper shopping bags. The event is free for members with a suggested donation of $5 for non-members.